I’ve got sunscreen, mosquito repellent, a rain coat, a swimsuit, and a Panama hat that will inevitably end up squished. I’ve got leg coverings in all forms including long leggings, short leggings, shorts, culottes and trousers. I’ve got white tops and I’ve got black tops. Do I need two kinds of runners and hiking boots? Do I need more dresses? Is six pairs of novelty oversized earrings too many? These are the questions I’ve been asking myself all week as I pack for my East African adventure. We fly out on Friday! 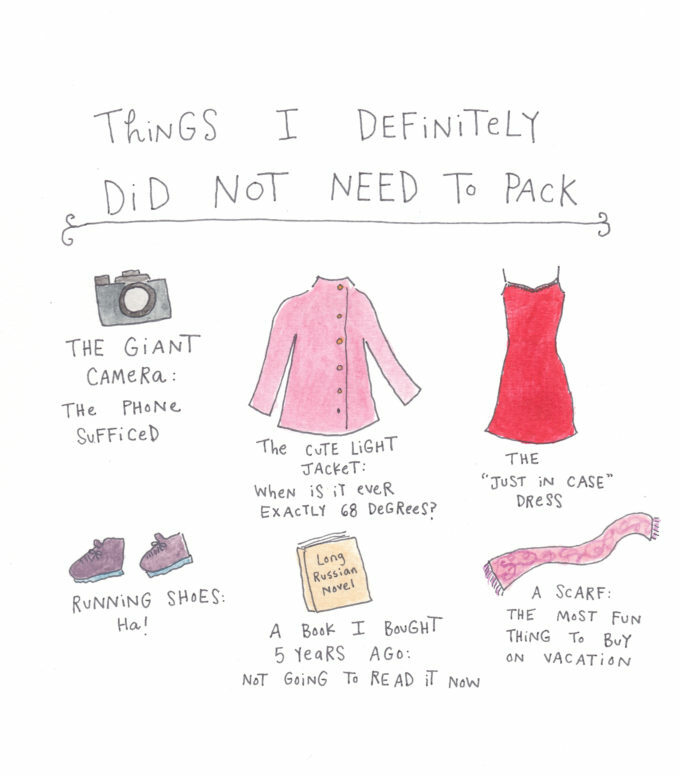 How do you decide what to pack for vacations? Check out my 8 essential items for long term travel and 10 tips for looking good while travelling. This entry was posted in Travel and tagged Packing, Travel. Bookmark the permalink. Have a GREAT time and be safe. Visiting with close family members that live far away is fantastic (hoping the Dolan family members feel the same way). I don’t want to forget to mention… Have a GREAT time. Thanks Eric! Visiting family and friends overseas is the very best way to travel! When are you coming to Aus? Soon I hope! Really?! That’s so bizarre! What would the kids do? Haha I’m still kind of half a brunette!